A TRULY TOXIC work environment is what the European Patent Office (EPO) became quite a long time ago. Employees have to cope with terrible, merciless rulers and give up many of their basic rights. Sick leave is the least of the problems, though media under the influence of EPO (like “media partners” [1, 2]) helps the management paint the situation and frame staff demands like this, essentially portraying the staff as arrogant and spoiled (the same media strategy the City of London used when Tube workers went on strike several times this past summer). The EPO’s management simply breaks some fundamental laws, ignores court rulings, and even bullies staff. People don’t want to work there and it’s easy to see why. Some want change, but some have given up. Some decide to go on strike, but some decide to just walk out the door for good. 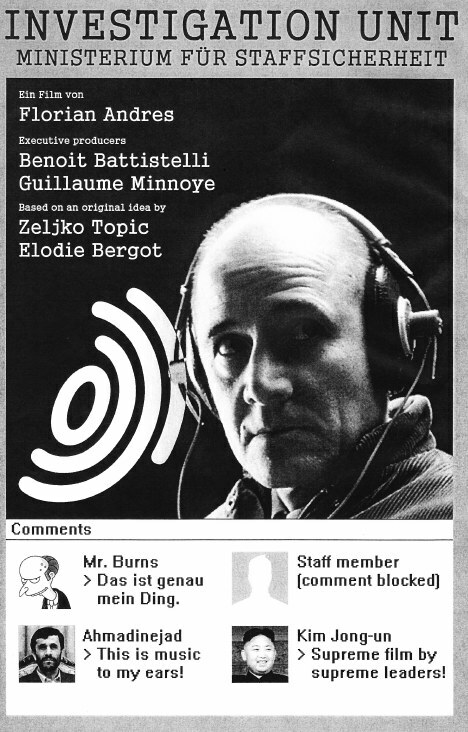 To use the words of one source of ours, the EPO Investigation Unit “illustrates the work sphere.” It’s like the Stasi, maybe worse, and it extends well beyond Munich (it is Office-wide across Europe). The Investigation Unit is international and it is aided by spies who even work outside of Europe. Good use of taxpayers’ money clearly it is not. “The Investigation Unit is international and it is aided by spies who even work outside of Europe. Good use of taxpayers’ money clearly it is not.”A toxic work environment — sometimes literally toxic — is something that I last discussed with my wife yesterday as she recalled her time working in Taiwan. After confiscating all workers’ passports (having forcibly, as per the oppressive rules, visited the police where everyone had to register) they proceeded to taking fingerprints, faeces samples etc. (people treated like cattle and reduced to mere objects, assets, resources). They were then exposed to cancer-causing X-ray (more than once) and were led to machines that not only ruined their vision but also their general health (because of exposure to hazardous chemicals). Moreover, they were pressured to work very fast in order to meet quotas and not only underperforming staff (based on very demanding standards) got laid off but also ones who had charisma and merely suggested that meals can be shared among colleagues; not only one such worker got fired (and ended up in tears) perhaps because she was deemed a potentially unionising force and thus a ‘threat’ but also her friend got fired, merely for association (or maybe fear of retaliation by communication after her friend got unjustly fired). Union-busting may be very prevalent in places like Taiwan and China, but it is also alive and well in Europe, not just famously in the US (Walmart for instance). For the time being, this is information that we can publish with the caveats, at least until we have some harder figures. We know about the fifth suicide, but what about people who make their way out of the EPO alive? We will follow up with publication if someone can send us additional details and preferably hard proof, aside from many anecdotes. According to suepo.org’s silence as of late, the atmosphere of intimidation has had a chilling effect on people who may want to come forth with information (members of the union and outsiders). We have seen cases of hesitance to speak out, even when information is available that can seriously undermine the rogue elements at the organisation. The EPO is so unbelievably corrupt, but there are things people know but cannot say (at least not yet). It’s almost as though fascist regimes are back with a vengeance even in Europe, but as long as they are compartmentalised, people don’t quite know about them. The EPO is a good example of a worrisome trend where an employer or a government treats staff and citizens like enemies, acting accordingly. To better understand why there are many EPO staff suicides one needs to know what happens behind closed doors, including revolving doors. There are people who move from war in Afghanistan to the EPO and from spy agencies to the EPO, where ‘interrogation’ techniques are now being used on staff. If only more people knew the full extent of what the EPO does, there would possibly be a mass exodus. “We kindly ask anyone with relevant information to consider contacting us.”Calls for the arrest of high-level EPO officials aren’t new, but apparently these thugs are too well-connected to face justice. To tackle the abuses of the EPO we don’t need MEPs to speak out; we need special units of German police and we need immediate action that is based on the hard facts. What the public really needs to know about the EPO is the stuff that EPO threatens people who speak out about.